The Malarrara Pro Teutonia and IGSA World Championships will be held in Teutonia, Brazil, November 4th through November 6th, 2011. The 1.2 mile course is notoriously fast. Competitors have been known to reach speeds in excess of 80 miles per hour. Last year's Downhill Skateboard winners were Canadians Kevin "K-Rimes" Reimer and Brianne Davies. The Vans Girls Combi Classic is an Invitation Only, Ladies Pro Bowl Competition with a sweet $10,000 prize purse. It is scheduled to take place November 4th and 5th at the Vans Skatepark located in Orange, California. Last year Lizzie Armanto landed first followed by Allysha Bergado, Mimi Knoop and Julie Kindstrand. This year new blood has been added and the battle will rage, especially since this event will be one of the few girl contest of 2011. Even if recently, Girls could be seen in a wide variety of contests that excluded them before: like The X-Games, The Maloof Money Cup, The Dew Tour, The Protec Pool Party, The Gravity Games, The Slam City Jam and basically all World Cup Skateboarding contests, 2011 has been one of the worst year for girls in the past decade: even if some organizers have slashed the girl’s contest participation in 2011, girls are on the rise in skateboarding, Big Time. The Vans Girl’s Protec Pool Party is the jewel contest that all girl bowl riders are waiting for. Moved last year from the regular Pool Party (in March) to November, the Girl’s Protec Pool Party it is the opportunity to see all those women in action and isTia.Tv has dedicated the whole month of October to review some of the best riders. The fourth and final Adrenalina Skateboard Marathon of the 2011 season is set to take place on November 5th in Hallandale Beach, Florida. Up for grabs is a $30,000 purse and bragging rights. The same day, the Deep End Pool Competition will unravel at Waitangi Park, Wellington, New Zealand (home of the Bowl-A-Rama). Last but not least, the Johnny Romano Skate Jam is scheduled to start on November 5th at the Southside Skatepark in South Houston, Texas. It is a pro skateboarding event with the proceeds goings towards charity. 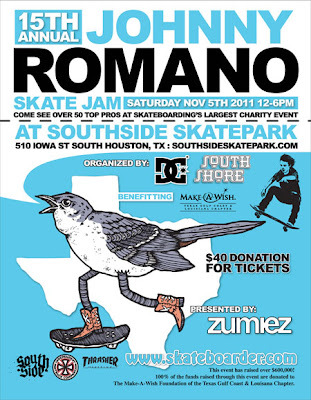 The 2011 event will be the 15th Skate Jam held at South Side Indoor Skate park For Make-A-Wish! The Annual Johnny Romano Skate Jam for Make-A-Wish is held in the honor of Johnny Romano, who passed away in 2008 at age 10. Romano, an avid skateboarder since he was two years old, was diagnosed with leukemia in the spring of 2005. More details are posted on Johnny Kicks Cancer website. Prior to 2006, the annual event was called the Texas Skate Jam for Make-a-Wish. Admission to the event is $40 a person and the all of the proceeds go towards the Make-A-Wish Foundation of the Texas Gulf Coast and Louisiana Chapter. Last year's event yielded over half a million dollars in Johnny Romano's name. Although the names of this year's participants have not yet been released, it is expected that more than 50 pro skateboarders are expected to be in attendance. In the previous years pro skaters such as Ben Hatchell, Chris Cole, Ishod Wair and Manny Santiago were participating and they will probably participate this year too. A King of the Groms and King of the Ams Qualifer will take place at the Progressive Skatepark located in Canton, Georgia, November 11th through the 13th. The contests are for skaters less than 16 years of age. Those who win the qualifiers will move on to the championship scheduled for June 2012. Also scheduled for the same week is the European Indoor Championships of Slalom Skateboarding. It is slated to take place November 12th and 13th in the Czech Republic. There will be events in the following disciplines; Skateboard High Jump Performance, Team Hybrid Slalom, Tight Slalom Duel, Straight Slalom Duel and Hybrid Slalom. Those interested in registering will find additional information on the Slalom Skateboarder website. The Telekom Extreme Playgrounds Men's Pro Street Invitational is scheduled to take place at the Velodrom in Berlin, Germany, November 18th through the 19th. On the line is a whopping $20,000 prize purse. In 2010 it was skater Phil Zwijsen who reigned supreme. He bested out Rodolfo Ramos, Kilian Heuberger, and Austen Seaholm for the honor.